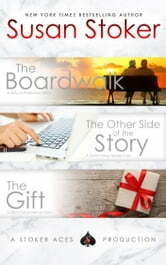 Three short stories by Susan Stoker, including The Boardwalk, The Other Side of the Story, and The Gift. These were sent out to Susan's newsletter readers previously. 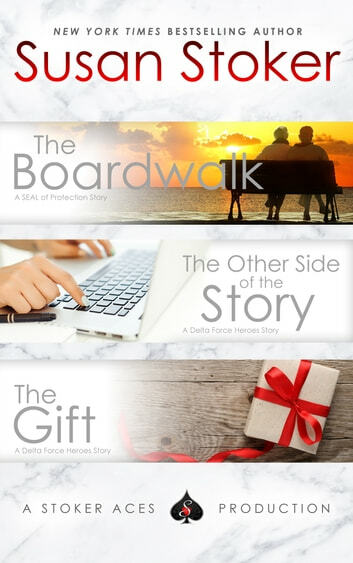 They include characters from her SEAL of Protection series as well as her Delta Force Heroes series. They can be read as stand alones. This is a book with 3 short stories in them. These 3 short stories are still super good, even though they are not nearly as long as Susan Stoker's normal books. In The Boardwalk, You get a future look (like they are old folks) at Wolf and Caroline. In The Other Side of the Story, You get to see Kassie and Hollywood's story get set up. In The Gift, you get to see little Annie and Frankie. You will just ADORE these stories like we always do!! I gave the book 5 stars because of the Boardwalk. It is very rare that I would write a review, but when I read the Boardwalk I felt I needed to write one. I will not write a review that gives away any details as it would spoil the story for others. I love Susan Stokers characters. I have read her who;e series. But Boardwalk made me cry. It is rare that a story would make me do that. I gave it 5 stars but if I could I would give it ten.